Community Wi-Fi, and also public Wi-Fi, have become key strategies for customer retention and growth for service providers in many regions. Not only does it give customers more pervasive connectivity, it also opens the door for new business models and services based on wholesale Wi-Fi. This is especially relevant with the rollout of 5G, when carriers are expected to ...provide much larger capacity by deploying many more small cells and hotspots. Residential hotspots, or "homespots," oﬀer an efficient way to provide community Wi-Fi using existing infrastructure. However, securing the internet access of community users over the huge installed base of legacy access points and home gateways is a challenge for operators and also a concern for the community users. It is even more difficult in homes that have distributed multiroom access points or range extenders that are physically separated from the home gateway. Cloud-based Wi-Fi Protected Access (WPA2) moves certain security functions from the customer premises equipment (CPE) access point system to the cloud to enable end-to-end secured internet connectivity. It works across any type of legacy network, CPE system, client device, and client operating system, with no impact on throughput and latency. Intel, Telenet, and ARRIS have developed a unique way to implement cloud-based WPA2 and conducted lab trials to demonstrate its benefits. 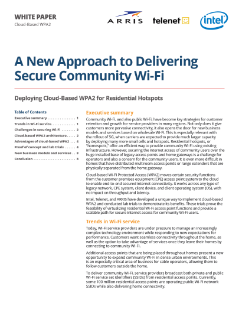 These trials prove the feasibility of virtualizing residential Wi-Fi access point functions and provide a scalable path for secure internet access for community Wi-Fi users. Demos how to identify the Intel® wireless adapter and driver version on a Windows* 7 machine. Experience faster internet, reduced lag, and better speeds on more devices with Intel® Wireless-AC.